Every one of us has a story we can share. Think of a past event in your life related to GBMC. Whether it’s care you received, an opportunity you have, or a loved one you remember, this event should have very personal meaning to you. What’s happened in your life since your experience at GBMC? Read Lee Ann Vasil’s story below, and share yours at www.gbmc50.com/mystory. 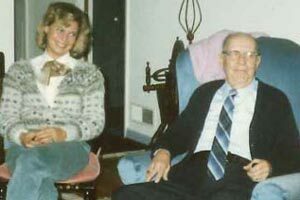 Lee Ann Vasil's Story: "The Best Surgeons"
About 50 years ago, when GBMC was brand new, my dad was still working as a supervisor in installation of products for BGE. He must have felt ill as he was driving near his home and stopped there to take a break. A neighbor noticed the company car was there for a long period of time and knew there must be a problem. The neighbor called his wife at her work and they soon got to my dad. They found him unconscious on the bathroom floor. An ambulance was called, and when my dad arrived at GBMC, he was told that his bowel had ruptured and needed immediate surgery. His condition was rapidly deteriorating but we were assured that he would be in good hands. How fortunate we were to have Dr. Geary Stonesifer ready to take care of him. This kind of surgery doesn't stop with the initial operation – there was a colostomy involved and then more surgery in six months to close it. It did not take the family long to realize that our very sick dad and husband had one of the best surgeons…someone that we could have only hoped for in our situation. Also, how fortunate that the ambulance took him to GBMC, where he was given very good care as he recovered from a serious situation. Two years ago my daughter, who was 58 at the time, had very intense pain in her abdomen and was rushed to the emergency room at GBMC. We were advised by her gastroenterologist that we needed to call in a surgeon. History had repeated itself, and my daughter's colon had also ruptured. She had been in a hospital near her home the week before with pneumonia and also had other health issues, which posed a very serious situation. Again, we had the good fortune that GBMC had another special surgeon, Dr. Francis Rotolo. I told him the day of surgery that I knew it was a very serious situation but knowing what a skilled surgeon he was gave me much encouragement. Her visits are now six months apart, and after two surgeries and two years of visits, we know what a blessing it was to once again have been fortunate to have one of the best surgeons for a very ill patient. I cannot imagine having to move to a place where I would not have this great hospital that has some of the very best surgeons. My father lived another 20 years. As ill as he was that day, I know how lucky we were to have had Dad long enough to see my daughter get married and to meet his great grandchildren. I have no other family but my daughter, and I can’t help but think how different my life and the life of her family could have been. After I retired, I knew I wanted to give back. I'm now a GBMC volunteer, giving back to the place that helped my family so much. Keeping your skin and eyes safe from the sun is an important aspect of summer health and skin cancer prevention. Typically the result of exposure to the sun’s ultraviolet (UV) rays, skin cancer is the most common type of cancer in the United States. The good news is that skin cancer caused by sun damage can be avoided with proper precautions. Early detection and proper treatment also make it highly likely that those who are diagnosed can be cured. It is essential to take precautions to help prevent the negative effects of UV rays. Use sunscreen. Sunscreen – which comes in many forms such as creams, gels, lip balms, lotions, ointments, sprays and wipes – with a sun protection factor (SPF) of at least 30, should be reapplied every two hours and after swimming or sweating to help protect your skin from burning. Sunscreen is just a filter and does not block all UV rays, so it is important to combine sunscreens with other forms of UV protection. Step out of the sun. UV rays are present year-round, but their strength changes with the time of year and your location on the globe. Periodically taking a break from the sun to sit indoors or in the shade, especially between 10 a.m. and 2 p.m. when the sun is the hottest, will allow your skin to recover and help you avoid over-exposure. Put on clothing. 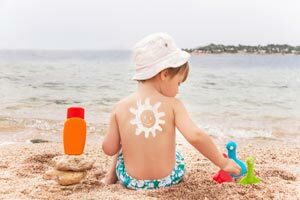 While an “even tan” is something many people strive to achieve, covering your skin a few times during your summer outing is best for your health. A hat with a two- to three-inch brim that has a dark, non-reflective underside will protect the sensitive skin of your head and neck, and a t-shirt will protect your shoulders and chest. Cover as much of your skin as possible to avoid burning and dehydration. Wear wraparound sunglasses. UV rays can cause eye problems such as cataracts. The delicate skin around the eyes can be harmed by UV rays, making wraparound sunglasses labeled with “UV absorption up to 400nm” or “Meets ANSI UV Requirements” essential to eye health. These labels mean the glasses will block out nearly 99 percent of UV rays, whereas cosmetic sunglasses will only block about 70 percent. Unlabeled sunglasses likely provide no UV protection. Avoid tanning beds and sun lamps. The UV rays present in tanning beds and sun lamps can cause long-term skin damage that contributes to skin cancer. The American Cancer Society recommends using a sunless tanning lotion in place of tanning beds and sun lamps. Regular skin examinations performed by a primary care physician or dermatologist can help to detect potentially harmful skin changes. Be sure to ask your primary care physician for a skin exam during your annual checkup. In need of a primary care physician? Visit www.mygbmcdoctor.com to select one who is right for you. When it comes to healthcare, the patient should always come first. That is why every GBMC primary care practice functions as a patient-centered medical home (PCMH), focusing on providing patients with better health and care at a lower cost. In addition to delivering evidence-based care, preventive medicine and management of chronic illness, PCMHs include patients as integral parts of their own care. Through proactive monitoring, caregivers at PCMHs help to keep patients healthy and out of the hospital. GBMC at Joppa Road is one of the organization’s nine PCMHs. The practice is located near the Towson Place Shopping Center and Calvert Hall College High School on LaSalle Road in Towson. With a care team that consists of three physicians, one nurse practitioner and nine other staff members, the practice has extended weekday hours to accommodate patients’ busy schedules. Paul Valle, MD, is board-certified in both family care and geriatrics, meaning that he is qualified to treat a wide age group of people, from pediatric patients to senior citizens. Alan Halle, MD, is board-certified in internal medicine and geriatrics, available to care for patients as young as 18 years and through adulthood to old age. Lama Al Samara, MD, is also board-certified in internal medicine with a special training in dermatology and endocrinology. In addition to the three physicians on the care team, nurse practitioner Johannah Butler, CRNP, has experience in adult and pediatric primary care and women’s health. She acts as an extension of the physicians to offer convenient, timely access to care. Other benefits of GBMC at Joppa Road include free parking and an on-site lab to make blood testing more convenient for patients. Like all PCMHs, the physicians and staff focus on wellness and prevention of illness, but they build time into their schedules to care for walk-in patients who are sick or have minor urgencies such as sprains. Appointments are required for non-sick visits like physicals. Additionally, the practice is equipped to care for patients who primarily speak Spanish or Arabic. If needed, nurse care managers and care coordinators are also available to help patients navigate the healthcare system. They can offer assistance with obtaining referrals, making follow-up appointments and locating social or financial resources to help patients meet their goals. Patients at GBMC at Joppa Road, or any of GBMC's PCMH practices, have secure and easy access to their electronic health records (EHR) through a Web-based tool known as myGBMC. Using myGBMC, patients can request prescription refills, look up test results, communicate electronically with their caregivers and view past and current statements. This is one more way that patients are empowered to participate in their own care. 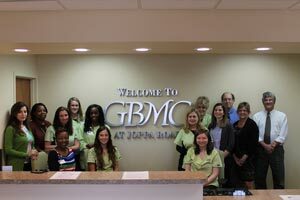 GBMC at Joppa Road is accepting patients of all ages. For more information about the practice’s office hours, insurance accepted or other inquiries, visit www.mygbmcdoctor.com/jopparoad or call 443-849-GBMC (4262). During the summer months, many people turn to swimming in pools, lakes, rivers and oceans as a way to beat the heat. Playing in or near bodies of water is certainly fun, but not without risk. Parents especially need to be vigilant about protecting their children from drowning, which occurs when a person dies due to asphyxiation caused by inhalation of water. There is another rare condition, known as secondary drowning, with which parents should familiarize themselves. Secondary drowning is marked by symptoms resulting from a serious near-drowning incident. It does not happen after a child swallows a small amount of water. Symptoms occur from a buildup of fluid in the alveoli of the lungs as part of an inflammatory response to the near-drowning event, not from the fluid that was inhaled during submersion. Secondary drowning can occur in both adults and children, but more commonly affects children. It can be difficult to recognize because the person appears to be fine shortly after the incident. 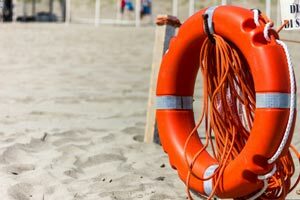 While it is rare to die from secondary drowning, it is essential that the victim be monitored closely for the first 24 hours following a near-drowning event. If any of the symptoms of secondary drowning occur, the victim should receive emergency medical treatment. Click here to view a Fox45 interview with Melissa Sparrow, MD, Clinical Director for Pediatric Inpatient and Emergency Services at GBMC, regarding the signs and symptoms of secondary drowning. 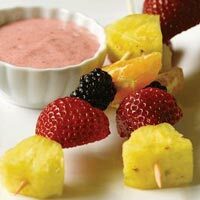 Thread two strawberry halves, two pineapple chunks, two blackberries, and one tangerine segment on each skewer, alternating between the fruit pieces. To prepare the dip, puree the strawberries in a blender or food processor. Add the yogurt, vanilla and honey and mix well. Serve two skewers with yogurt dip on the side. Recipe Source: Reprinted with permission from Keep the Beat™ Recipes: Deliciously Healthy Family Meals. U.S. Department of Health and Human Services. National Heart, Lung, and Blood Institute. NIH Publication No. 10-7531. Page 73. December 2010.